Former U.S. Treasury secretary Tim Geithner said Europe is staring at a "terribly tough, long road ahead." The dark clouds looming above Europe may be even more ominous than people realize. Former U.S. Treasury secretary Tim Geithner fears embattled Europe faces a long slog ahead which could be even worse than Japan's long period of lost growth. 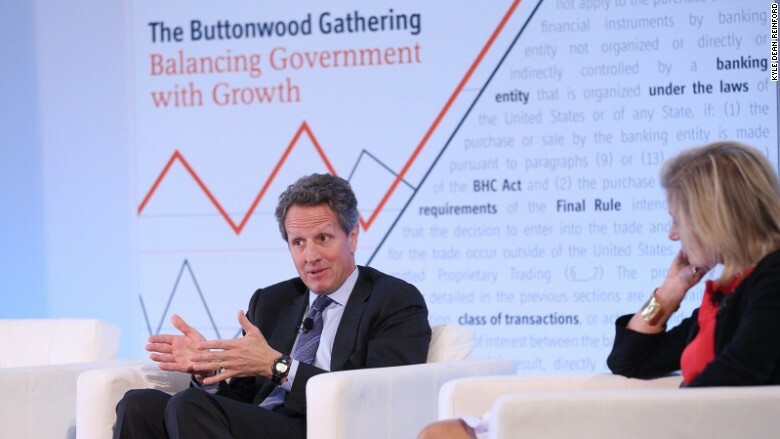 "They've got a terribly tough, long road ahead of them," Geithner said on Tuesday, while speaking at The Economist's Buttonwood Gathering in Manhattan. Since the early 1990s Japan has struggled to escape a depressing spiral of nonexistent economic growth, falling prices and mounting debt. Initially known as the "Lost Decade," Japan's nightmare has actually lasted over 20 years. Geithner went so far as to say that Europe would actually be "lucky" if it suffered Japan's fate. That's because Japan's per capita income growth and unemployment rate weren't as dire as what some European countries are facing currently. Limited, fragile growth ahead: Europe is currently struggling with high levels of unemployment, unsustainable debt and a scary bout of deflation. "Even the best, most optimistic view of what's possible is going to result in very limited, fragile and divergent growth trends," said Geithner. Related: European stocks love QE. Can the rally last? Belatedly turning to the Fed playbook: Geithner should know because he was part of the team that helped resurrect the U.S. economy following the Great Recession. Not only did the U.S. enact a stimulus package worth roughly $800 billion, but the Federal Reserve slashed rates to near zero and launched an aggressive bond-buying program that boosted stock prices. Now the European Central Bank is taking a page out of the U.S. playbook. It's attempting to fight deflation by printing over $1 trillion to buy bonds. Of course, the ECB moves are coming years late, even as the Fed is already pulling back. "We adopted a dramatically different strategy and had dramatically different results," said Geithner, who served as president of the New York Fed before being tapped by President Obama to run the Treasury Department. Geithner acknowledged the comparison is a bit unfair. After all, the U.S. economy has strengths that Europe doesn't. The most glaring one being that the ECB has to deal with 19 different countries, all with their own tax and spending policies. Greece could infect eurozone: Those differences have been on full display in recent weeks as Europe struggles to reach a deal to keep Greece from leaving the eurozone. Geithner said the Greek drama highlights the risk of political contagion that the currency union has faced since it was founded in 1999. The comments echo concerns in financial markets that a Greek exit could embolden other high-debt eurozone countries like Spain and Portugal to pursue their own departures. American optimism: The former Treasury secretary is much more optimistic about the outlook for the U.S., which is growing faster than its peers but is still struggling to increase wages and overcome income inequality. Geither said America's challenges can be overcome. "I like our challenges," he said.